After a crucial overtime drive led by Colt McCoy resulted in a field goal, the Washington Redskins (2-5) found themselves leading the Dallas Cowboys (6-1) in the football game 20-17. Tony Romo had returned to the game after being knocked out with an apparent back injury, and this was his last chance to prevent his team’s rival from stealing a victory. First down. An eight yard run by DeMarco Murray. Second down. A short pass to DeMarco Murray that resulted in a loss of one yard. Third down. An incomplete pass to Jason Witten and an injury to Cowboys guard Ronald Leary. Fourth down. I’m sweating. Tony Romo drops back to pass and slings it toward Dez Bryant on an out route. 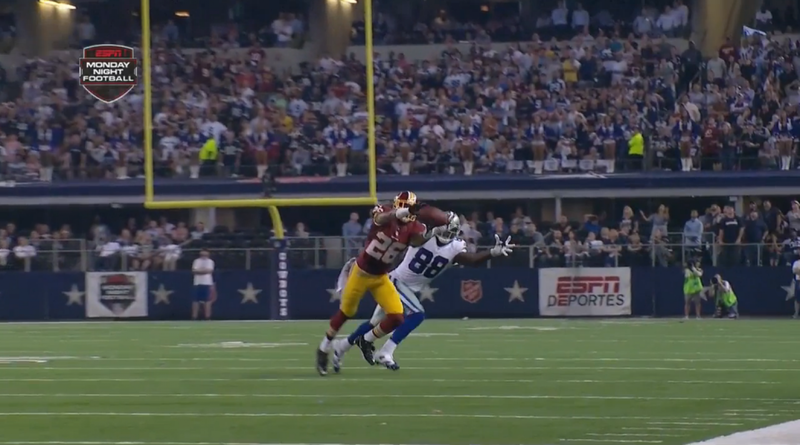 BASHAUD BREELAND BREAKS UP THE PASS AND SEALS THE UPSET! There you have it, ladies and gentlemen. That’s pretty much the only noteworthy moment of the 2014-2015 season for the Washington Redskins. We can all go home now. What’s that? The Skins are on Sportscenter again? Great. The Redskins have made four separate changes at the quarterback position in 12 games this season both due to injury and poor play. From RGIII to Kirk Cousins to Colt McCoy to RGIII and back to McCoy, the team is a complete mess and is a lowly 3-9 after entering the season with such promise. It breaks my heart week in and week out. Robert Griffin III started game one this year after finally logging a complete offseason. With the addition of DeSean Jackson and Andre Roberts to go along with Alfred Morris, Pierre Garcon, and the emergence of Jordan Reed, things were finally looking okay. Fans were excited and ready to go. Licking their wounds, the Redskins traveled home to face the punchless Jacksonville Jaguars. Young Bob was confident that he could pull it together against this weaker opponent and slower pass rush. He got injured. Again. Enter Kirk Cousins. After a shellacking of Jacksonville, fans were screaming his praises, and all of the bigwigs that said Kirk Cousins was the player that should start in Washington were getting their “I told you so” caps ready. He looked great against Philly in week three, but that turned out to be a simple case of the Eagles’ lack of ability to gameplan for the new “threat.” He came back down to earth in week four. In fact, it looked more like he dug a hole under the earth and crawled into it. He lost a fumble and threw four interceptions in the second half. New York Giants cornerback Zack Bowman was quoted saying “It’s like Christmas.” It would be different if this happened against a good team, but, well, look at what the Giants not named Odell Beckham Jr. have done this year. This was just one of the plays in his three-touchdown, 392-yard performance against the Indianapolis Colts in week 13. McCoy has two of the team’s three wins, so he should keep the job, right? All of the problems are finally solved, aren’t they? McCoy’s great effort in week 13 ended up utterly futile. The Redskins lost to the Colts 49-27. All of the attention concerning the Washington Redskins this season has pertained to who would be under center. If you’re looking for my answer to the question, you’ll never find it, but it’s not because I don’t know the answer. It’s because the answer to that question is a moot point. Yep. The Redskins offensive line cannot pass protect to save its life. Amongst those 392 yards and three touchdowns for Colt McCoy in week thirteen are six sacks and a fumble lost. Six sacks. Peyton Manning has only been sacked 13 times this entire season, and he’s far less mobile than any quarterbacks the Redskins have on their roster. They’ve given up an incredible 39 sacks thus far, which is good for the second most in the league. It doesn’t matter who you trot out there if your protection can’t give him more than two seconds to make a decision on any given play. It’s like these guys are playing backyard football and their opponents are constantly cheating the three-Mississippi rule. It’s ridiculous. But hey, Washington still scored 27 points despite poor pass protecting. There’s hope, right? Look at the other side of the box score, folks. 49 points. Andrew Luck threw for 370 yards and five touchdowns on only 19 completions. No halfway decent secondary should allow any quarterback to post those numbers. The three final scoring drives, if you can even call them “drives,” by the Colts tallied a grand total of eight plays that went for three touchdowns. One was capped by a 48-yard pass to Donte Moncrief, the second by a 73-yard pass to Coby Fleener, and the third by a 79 yard pass to Donte Moncrief. Yes, Andrew Luck is very good and its incredibly depressing to see him excelling so much when RGIII was taken immediately after him in the draft, but he’s not the only one to dismantle the Washington secondary this season. In week 11, the Redskins made Josh McCown look a lot like Andrew Luck on his way to 288 yards, two touchdowns, and no interceptions. Guess how many games this season Josh McCown has avoided turning the ball over. I’ll give you a hint; It’s zero. In week four, Eli Manning shredded the Skins for 300 yards and four touchdowns on his way to the second of only three New York wins. Injuries have depleted the unit a bit and left its lack of depth exposed. David Amerson is growing. That’s nice to see. 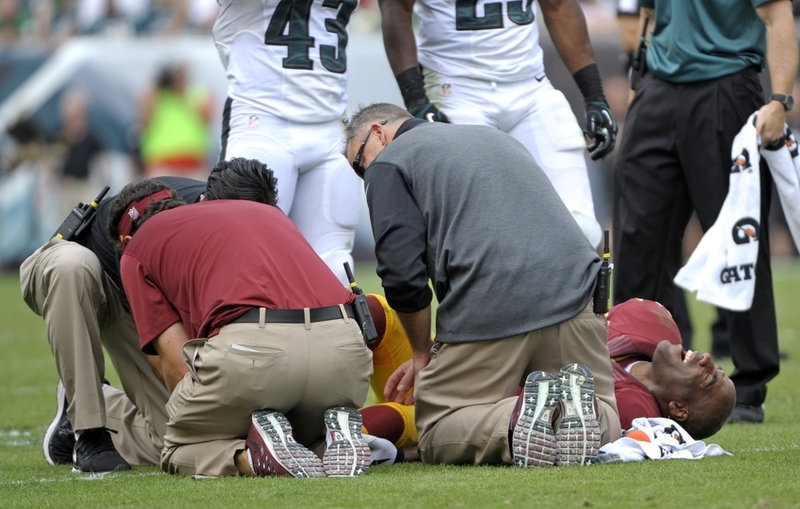 Bashaud Breeland has been inconsistent, but has shown promise, especially against the Cowboys. Ryan Clark is old and is a veteran leader, but he is a very temporary “fix.” The others? Two weeks ago, I stared perplexedly at my television as I reached deep into the recesses of my mind to figure out who the heck Greg Ducre was. Phillip Thomas played some when Brandon Merriweather got hurt, but he clearly hasn’t worked out. Oh, and neither has Merriweather. Last week, I caught a glimpse of my UVa boy Chase Minnifield. That was 5% exciting and 95% depressing. The guy has been on and off the practice squad and the active roster. The team has even waived him a few times, but I guess it resigned him. Wouldn’t you love it if one of your perennial practice squad guys came in to defend T.Y. Hilton? 26.8 points allowed per game is a big no bueno. So what do you want to know? Who should start at quarterback? Frankly, it doesn’t matter. I’ve been saying it for weeks, but now it’s becoming more and more obvious: the quarterback quandary should be the least of the concerns for woeful Washington. It doesn’t matter who starts. Go out and get Rex Grossman back for all I care. Or find a robot that can survey the field and make decisions in under a second. One that won’t get injured when it is sacked 39 times in twelve games. All I ask is that we pay more attention to our other problems. FINE. Here’s my response: Leave Colt McCoy in for now. He seems to be the only one that has any sort of ability to win right now (If winning right now is really what you want. It’s already a lost season…). 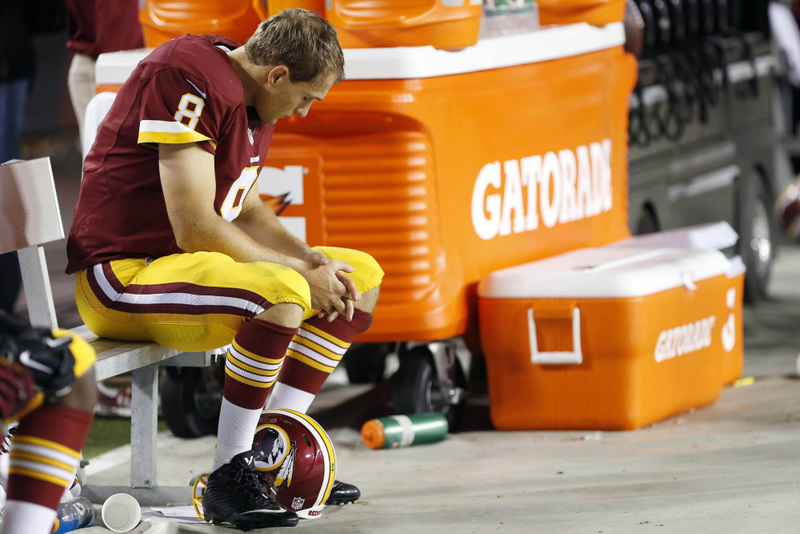 Kirk Cousins is nothing more than an afterthought at this point. Robert Griffin III is a shell of who he was in his rookie campaign because he isn’t a threat to run the ball anymore. It also seems a lot like he doesn’t even know the playbook or his reads in this new offense. Chris Cooley did a little analysis of him and tore him to shreds. There’s still a bit of hope for Young Bob. If he works hard, learns the playbook, refines his mechanics, and figures out how to become a scrambling quarterback that knows how to slide, we may see him back and playing well. The clock is ticking though, and it’s starting to look a lot like he needs to go. The drama is poison for the organization. Everybody else is pointing fingers, so I might as well, too. I’m looking at you, front office. Hire the best scouts you can find and fix the secondary. Fix the offensive line. Who am I kidding? The Redskins will never be good while Bruce Allen is the general manager. They will never be truly good until Dan Snyder either sells the team or undergoes a complete shift in his ownership style. We’re in for a long winter, Redskins fans. 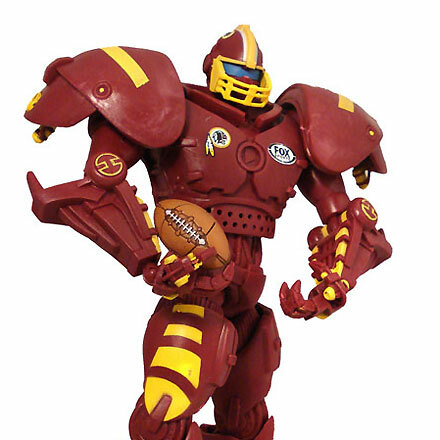 This entry was posted in General, NFL and tagged Alfred Morris, Andre Roberts, Colt McCoy, Dan Snyder, DeSean Jackson, football, Jay Gruden, Jordan Reed, Kirk Cousins, NFL, Pierre Garcon, Robert Griffin III, Washington Redskins. Bookmark the permalink. Ope. Looks like it’s super over for RGIII.